Last night a strong front passed through this part of North Carolina. We could see the trees bending over around the parking lot and twigs and leaves pelted the side of the coach. It was over quickly and we slept to the sound of rain the rest of the night. This morning between showers we were outside and Bill drove by and told us the new pavilion had been blown down during the night. We drove down and saw the sad sight. 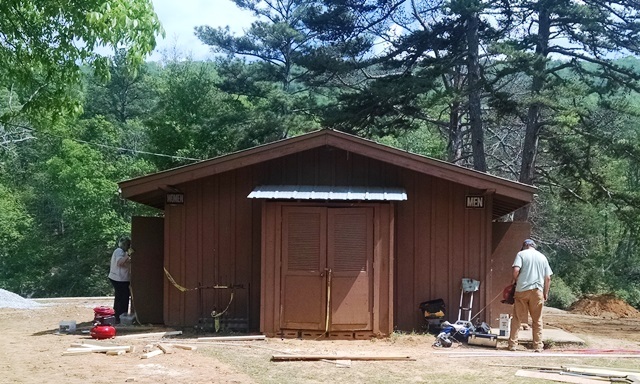 We had heard they were planning a ribbon cutting for the pavilion this week and part of our project was to finish the restrooms and equipment room there. Don’t guess that will happen now. Before church Anne got a message from her brother in Atlanta that her sister-in-law had taken a turn for the worse. He was needing some help and support so she drove to Atlanta to be with Jim and Marguerite. Marguerite has been battling ovarian cancer since 2015 and things are not going well now. Interestingly the drive to Atlanta from Hayesville was beautiful. Google’s suggested route led over some really windy north Georgia mountain roads with steep inclines and descents. Hopefully Anne will be back to work in a day or two. 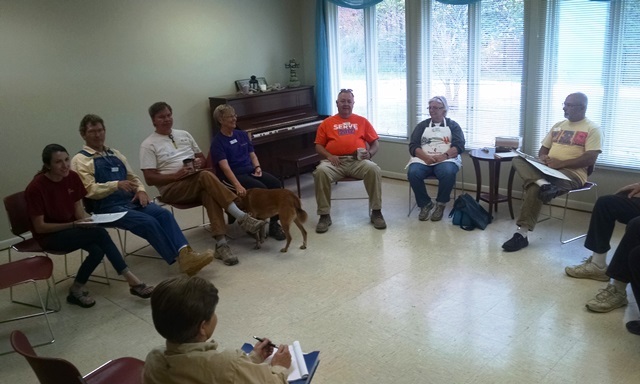 We all attended church at Oak Forest UMC, which is just down the road from the Hinton Center. Every time we have been there the service has been very well done. Today was no exception. And the congregation always makes us feel welcome. After the service the team decided to go to Rib Country for lunch. We came back to camp instead to get Anne ready to go to Atlanta. Max spent the afternoon walking around campus, greeting Gene and Oneda, the final two team members to arrive, and preparing for the initial team meeting. Since Anne wasn’t there he had more to do like getting the food ready. It rained most of the afternoon but stopped just before time for the meeting. 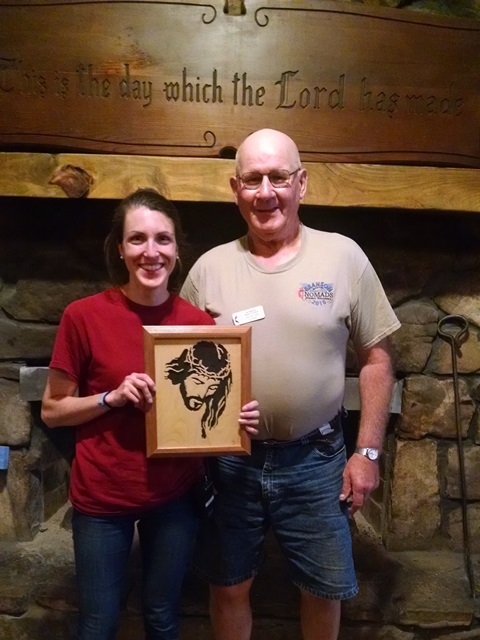 We met at the lake house which is also where we will be having our daily devotions and where we will be working. The meeting started with everyone introducing themselves and telling about their families and NOMADS experience then we covered all the required informational and safety topics. After that, Bill discussed the tasks we will be undertaking. We ended with a few snacks and fellowship. In other words – our usual agenda. This seems like it will be another fun group and we are looking forward to working with them and accomplishing a lot for Hinton. The forecast calls for more rain tomorrow (we are under a flood warning) so we are thankful for inside work. Today has been cloudy all day and we have been under a flash flood watch all day but we had only a few drops of rain until a few minutes ago. It is now raining like crazy and the outside temperature has dropped 14 degrees in the past 55 minutes. This area still needs rain. Last fall when we were here they were experiencing even worse drought than we were in Alabama and while it is better, the lake is still obviously low. 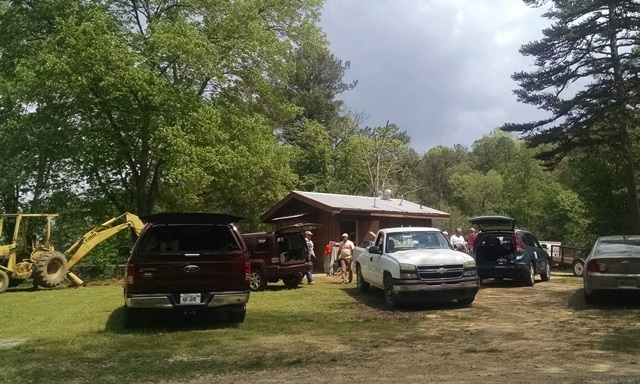 We are just thankful that all but one couple of our team have arrived safely and got set up before the rain arrived. We have one more couple who should arrive tomorrow afternoon. We walked around the camp today to see the changes since we were last here. They are trying to make some improvements and spruce up the place a bit. 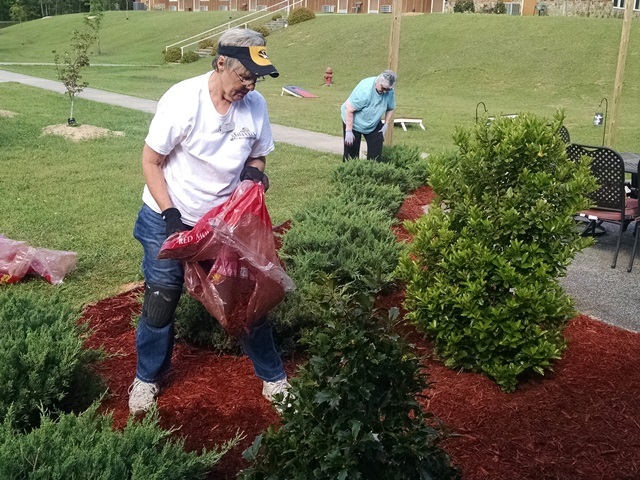 Today was Volunteer Work Day and there were a lot of people out working on the grounds/landscaping, helping in the office etc. The flowerbeds are looking good and a lot of weed-eating was done. Dave came over for breakfast with us this morning since his sweet wife isn’t here yet. Cheryl arrived while Dave was still with us and we helped her get parked. No that she needed much help. We spent some time just getting organized and set up after a travel day. Next in was Sandra and Steve. It’s great to see them again. We have met them before but never worked a project with them. We look forward to getting to know them better. We parked them up by Young Commons Building, the building we painted inside and out last fall. We will have two RVs there and four in the lower parking lot. When we walked down to the lake we went by to take a look at the Lake House. The outside looks good but we were not sure if the people had left yet so we didn’t go inside. We will do that tomorrow. Even though the water is down the lakeside still looks good. 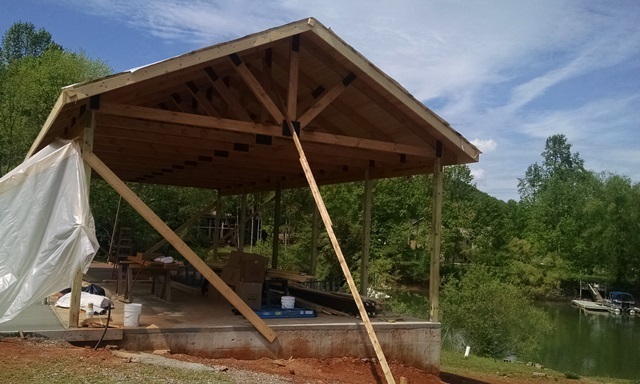 They are building a pavilion down by the lake that is looking really nice. 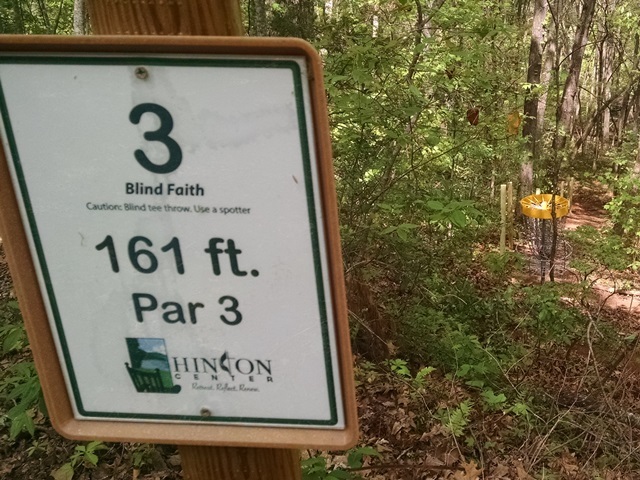 Another improvement at Hinton is a 9 hole disc golf course. It was here but really not very usable when we were here last fall. With the help of a local NOMAD they have really cleaned up the course, installed needed steps and placed signage at each tee. We will have to get out our discs and try it out on a cool, dry day. Should be fun although it looks like it could be a bit challenging for our skill level. We really aren’t very good. Our last couple of the day arrived about 5:00 and easily parked next to us. They are relatively new NOMADS and we had not previously met Bryant and Jackie. They seem very nice and we will enjoy getting to know them. 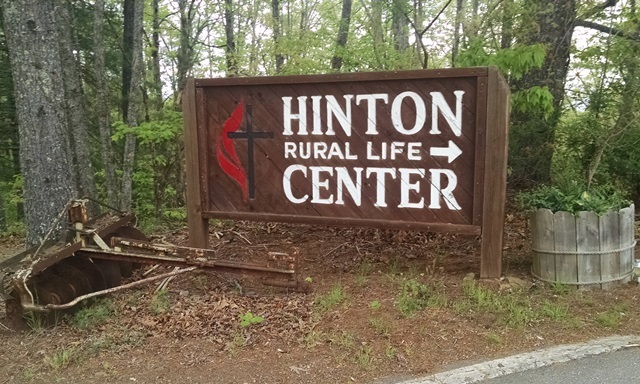 Tomorrow we will go to the small church that is just down the road from Hinton and have our opening meeting. Remember to be praying for tomorrow’s services. Unlike the last time we came to Hinton from Sumatanga, we had an uneventful morning and an easy completion of our departure checklist. We said some final goodbyes to Richard and Bill and Marti. Everybody else was still asleep and we had said goodbye to them last night. Sad to leave such a wonderful group of friends. It was a sunny day for most of the drive. We left Sumatanga and took I-59 to Chattanooga. It was an uneventful drive until the road construction in Chattanooga. YUK!! Long backup and crazy lane changes and lanes that just run out. 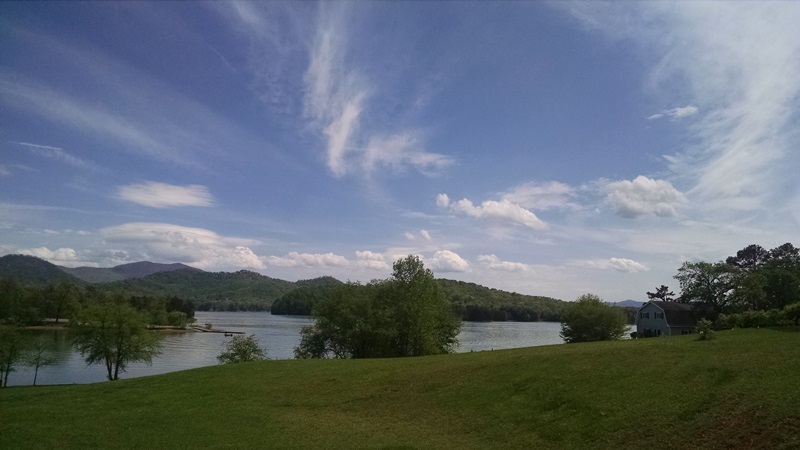 Once we were thru there it was an easy and beautiful drive along the Ocoee River. It’s a lot of curves and somewhat narrow, but really nice scenery. 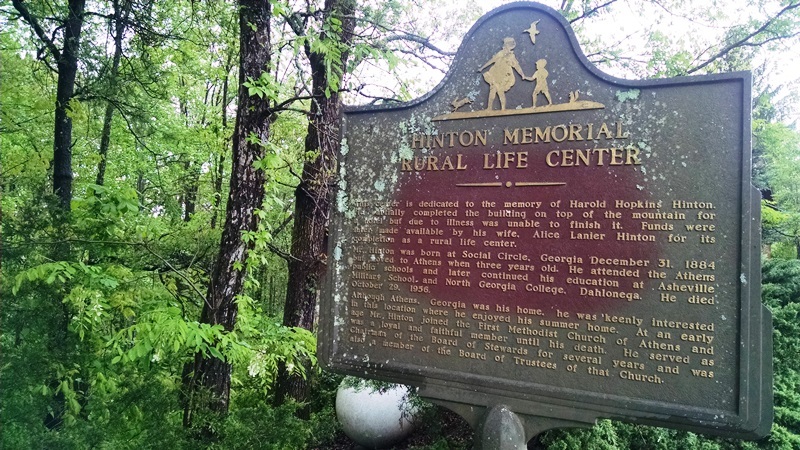 We made it to Hinton Rural Life Center with just a few sprinkles of rain and got all the outside setup done before the significant rain started. 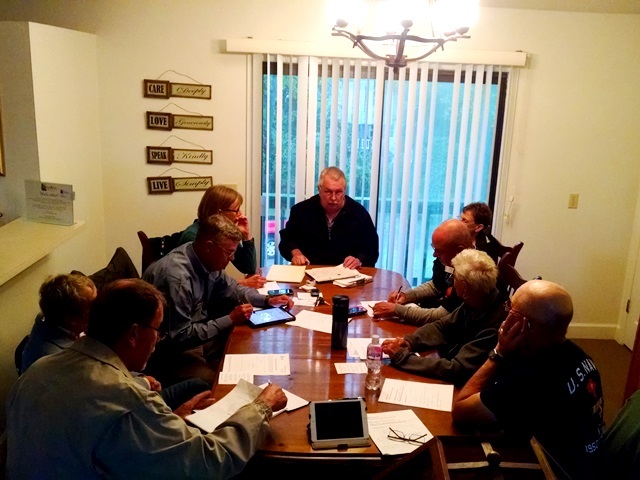 After settling in a little we met with Bill Curns, our agency contact, to begin going over our work plan. 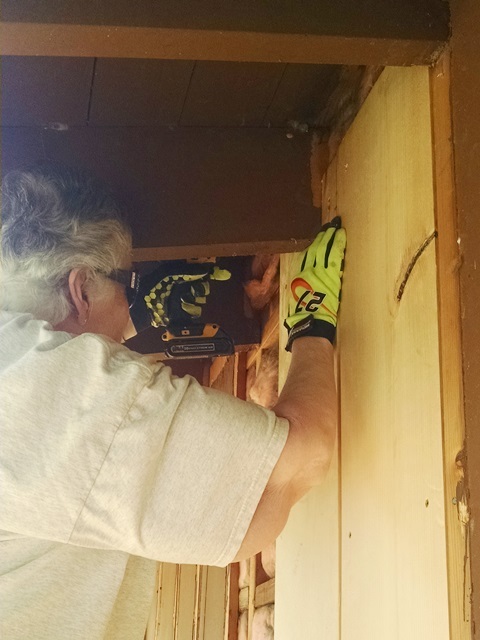 We will be remodeling the Lake House along with some other tasks. 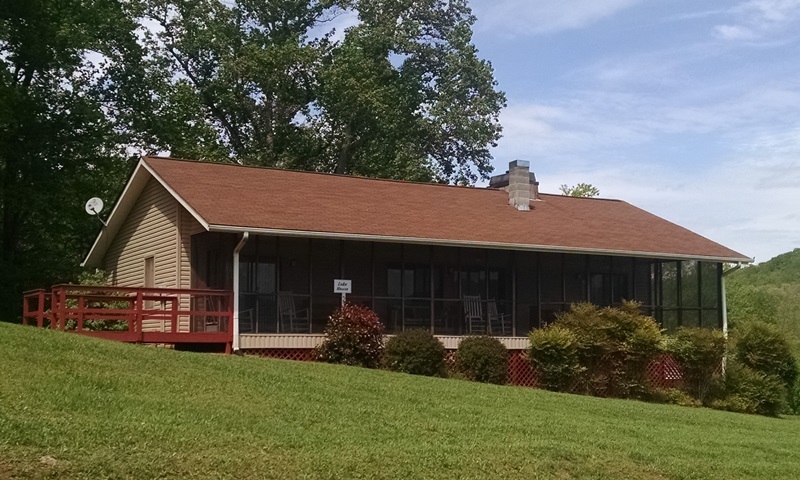 The Lake House is rented until tomorrow so we will wait and tour it then or Sunday afternoon. From the project list it sounds like we will have plenty to do and a lot of fun. 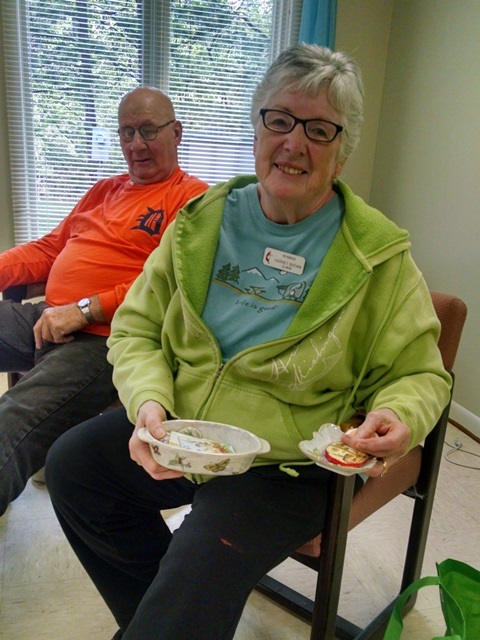 While driving over we received a phone call from NOMADS Kathy and Bill who live in Hayesville, wanting to get together tonight, visit and go to dinner. They came over about 7:00 and after we got Dave parked we all went out to dinner at Rib Country. Sorry, we forgot to take any pictures. We are so glad they called and we were able to see them again. We worked with them at MMDC in Chatham, IL last year. Thank you so much Kathy for calling us. Safe travels. We are looking forward to the rest of the team arriving tomorrow and Sunday and getting to know everyone. It should be a really good three weeks. Will try to get some pictures of some of the Center tomorrow. We have had almost 2 weeks of near perfect weather. Another gorgeous day!! We always like to do the devotional to close out a project when we are leaders. Today we talked about laughter. “A cheerful heart is good medicine, but a crushed spirit dries up the bones.” (Proverbs 17:22) This group has laughed so much, so hard and so long that we certainly can’t have dried up bones. We reviewed some of the real medical benefits of laughter and then challenged them to take this to their home small groups, to their next project, and pass it on. Certainly with all the bad things happening in the world, our country, and our state, it’s easy to get upset and down. We must share and encourage all to remember “This is the day that the Lord has made. I will rejoice and be glad in it.” We have declared this the NOMADS fight song. We hope we can all share our joy and hope and laughter with others and let by so doing, this three weeks continue. This is our last day so we reviewed what we have done and today decided to concentrate all our efforts on getting the Lakeside Loo as far along as possible. We knew from the beginning that we probably would not finish this task but left it in good shape and hopefully it won’t take too long for the maintenance guys to finish it up. 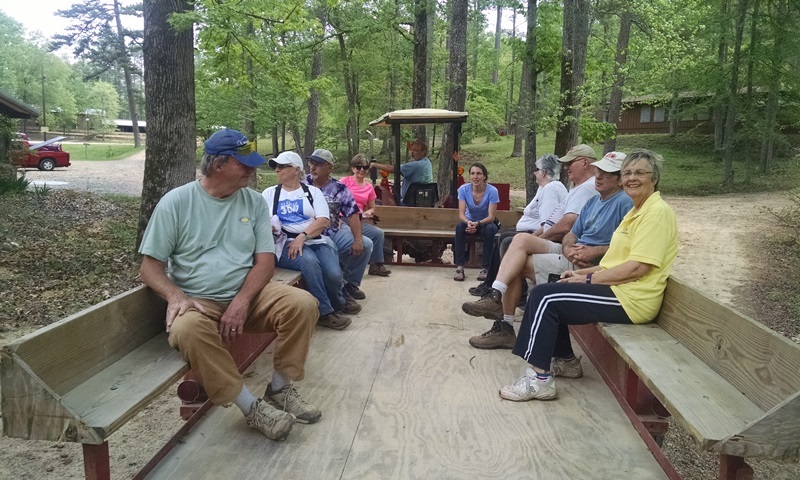 We also finally – on this the last day – took the team on a non-hay ride tour of the camp right before lunch. This three weeks went by really fast. So just what all have we done. 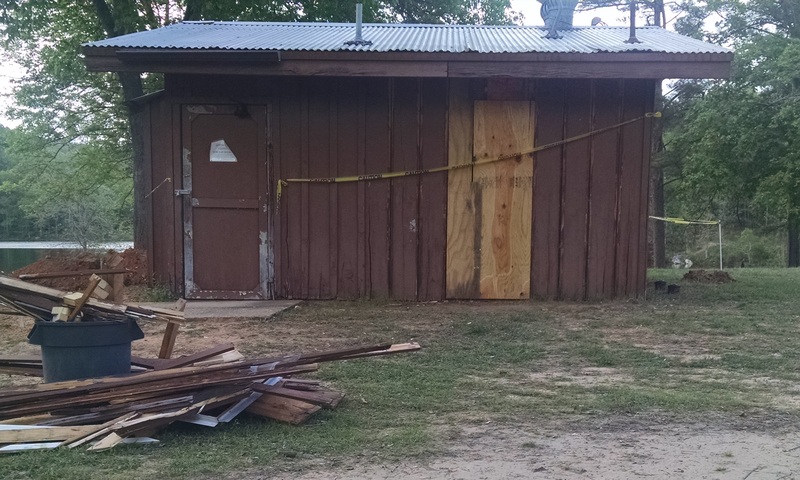 We started by moving everything movable out of the kitchen and pressure washing and scrubbing the kitchen floor at Pool Camp. 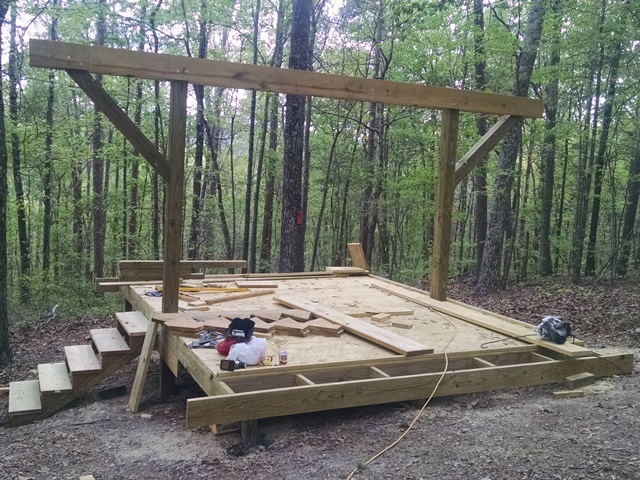 We then started some construction and enclosed the loading dock area of the kitchen at Pool Camp. We built a new wall, moved the sink to that wall and installed the plumbing in the kitchen. We also enclosed some pipes in the kitchen. Then we moved everything back into the kitchen so that it could be used for about 140 kids that came for a weekend retreat that was part of their confirmation classes. 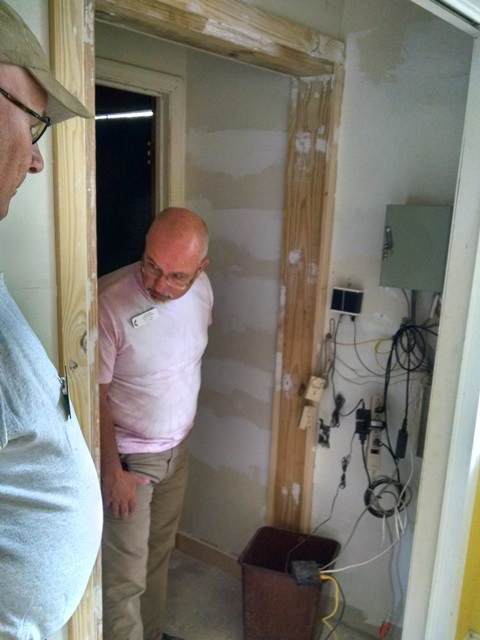 We worked in Little Brown, moving some electrical and telephone service so that a closet could be opened making a way to reach the bathroom from the summer staff break room. 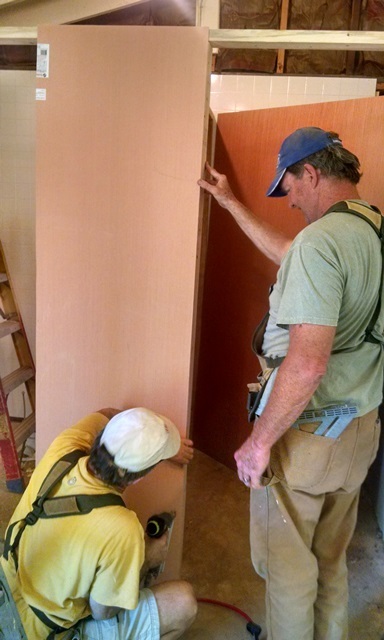 The walls around the opening had to be framed in and covered with drywall which was then mudded. A new breaker box was installed replacing a quite old fuse box. 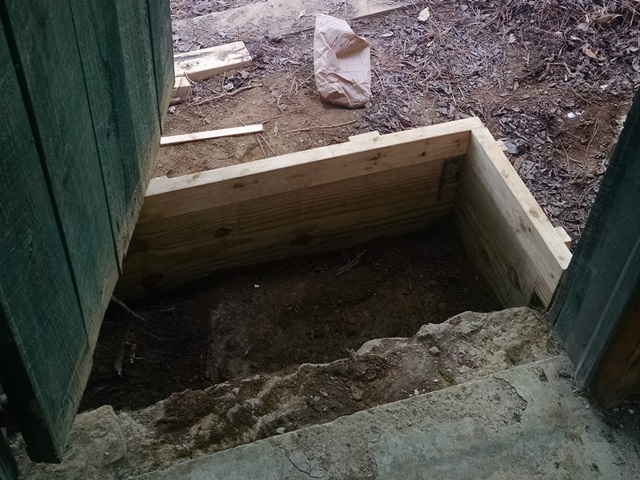 An exterior door was reopened up for use and a step area framed in for concrete. 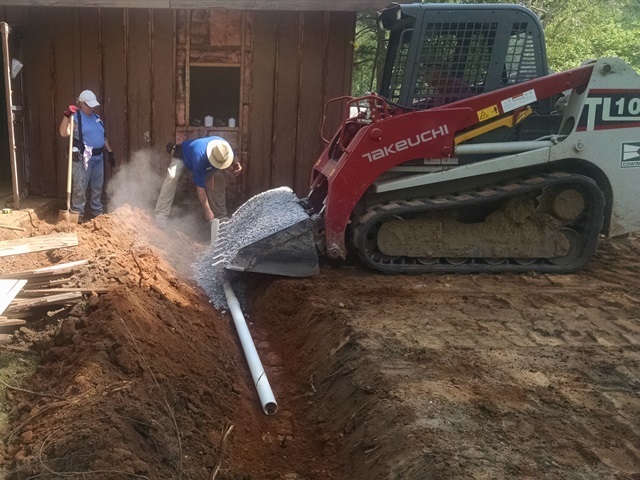 An enclosure was also build to cover and protect the telephone equipment that was moved. A condensate pump was also installed. The worship supplies storage room was reorganized and supplies were taken to media/worship supply areas at Pool Camp, McKinney, and the Lodge. 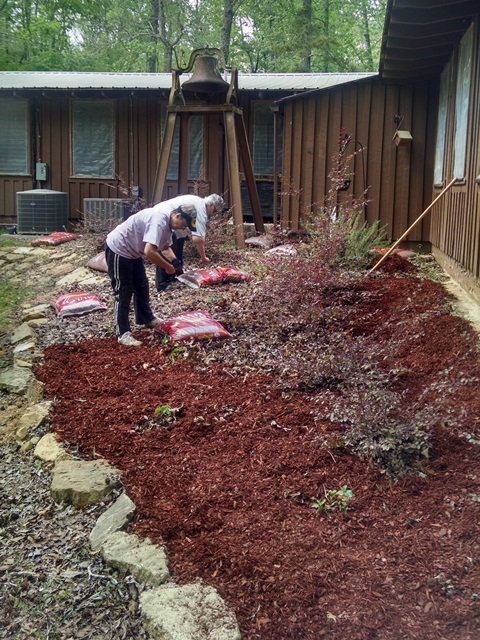 Flower beds at McKinney, the Lodge, Eva Walker and Pool Camp were weeded and mulched. 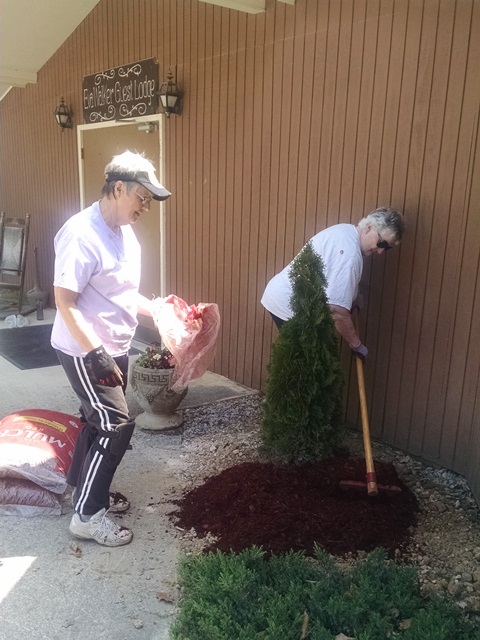 We put out more than 120 bags of mulch. 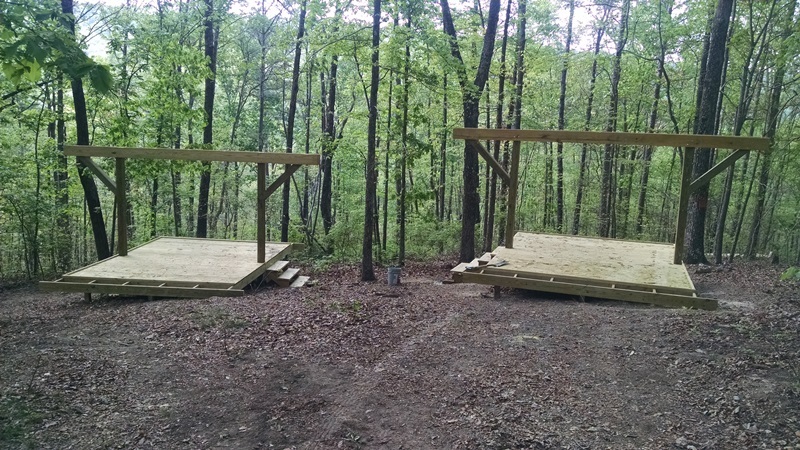 We completed two previously started tent platforms and built two more for base camp. 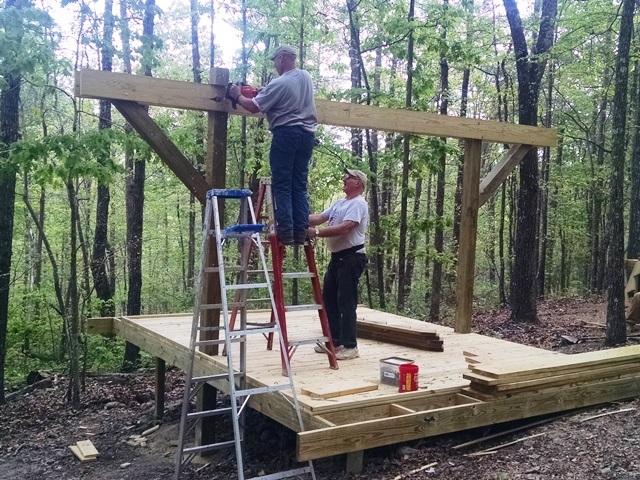 This included installing 20 foot ridge beams on all four platforms as well as building steps for all four. We also dismantled some of the old ropes course and hauled it off. At the Lakeside Loo the first step was designing and drawing a plan for the remodel. Then the tear out and clean up had to be done. Two windows were removed along with most of the 1×3 trim on the exterior. 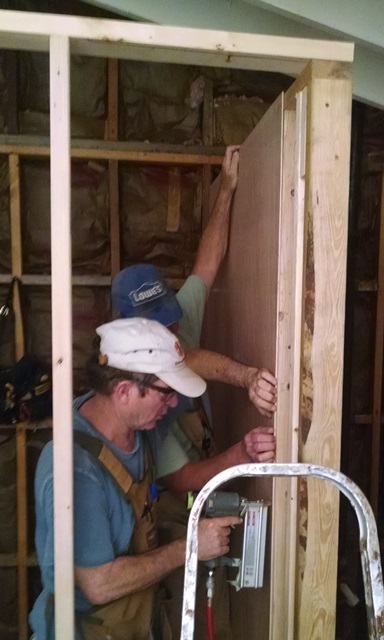 The rebuild was started with the base plates being installed in both sides and walls and partitions being framed in. 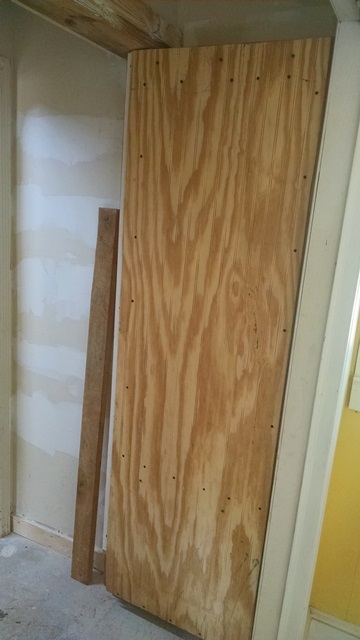 Some of the wall board was installed and some of the new 1×3 exterior trim was re-installed. We think that is a lot of work for 12 days work. We are all tired but also pleased with what was accomplished for the camp and the people who will be coming to Sumatanga in the future. It was a great three weeks of working along side the Sumatanga staff and helping them get some of the projects done. 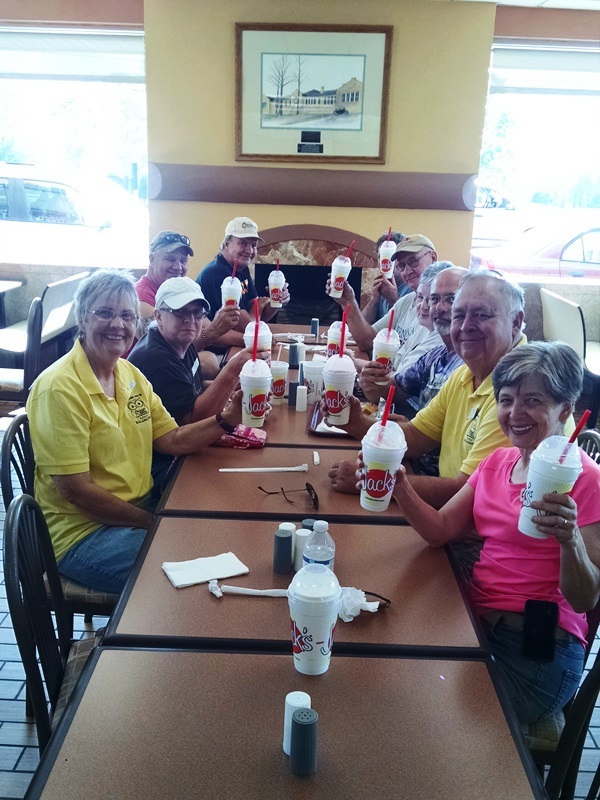 After finishing up today we all went back to Jack’s for BOGO milkshakes. Tim went with us and we all sat around visiting and laughing. Such good times. Once again, we have made some wonderful new friends, spent wonderful time with old friends, and have been so blessed by this team and everyone at Sumatanga. Please pray for everyone’s safe travel this weekend as all but Bill and Marti will be on the road tomorrow. It’s on to Hayesville, NC and Hinton Center tomorrow for us. Well, it was another beautiful day. 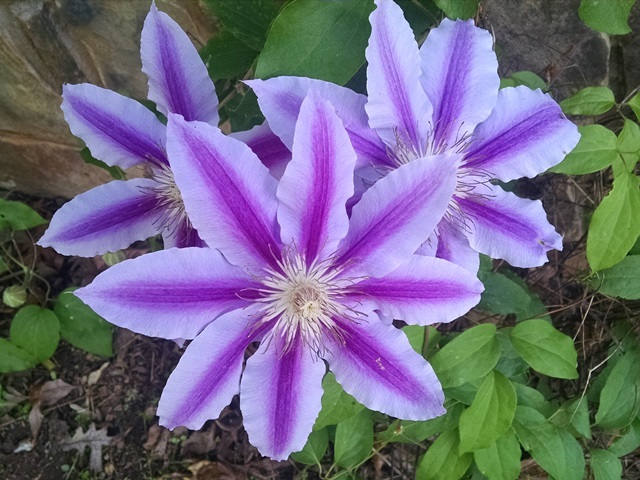 Know you are probably getting tired of hearing that, but we are not tired of experiencing a wonderful spring. Actually today felt almost like summer. Working in the heat made for a sweaty day. Carol had our devotion today and it was another good one. She started by telling us about her first mission project with ASP (Appalachian Service Project). 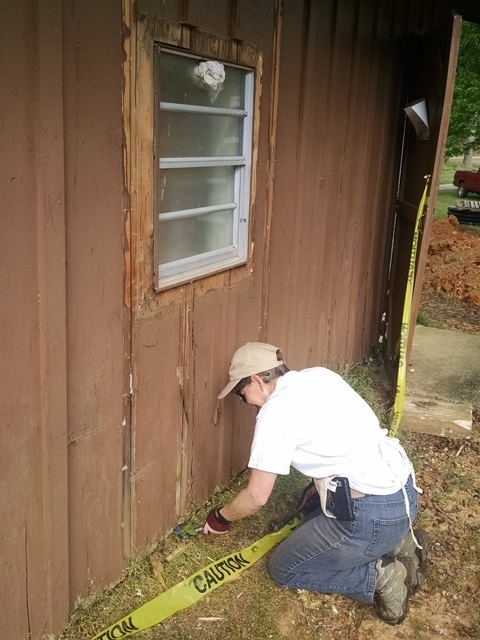 She had never done sheetrock, mudding and taping. But someone took the time to teach her and she learned. Each project she has learned more. 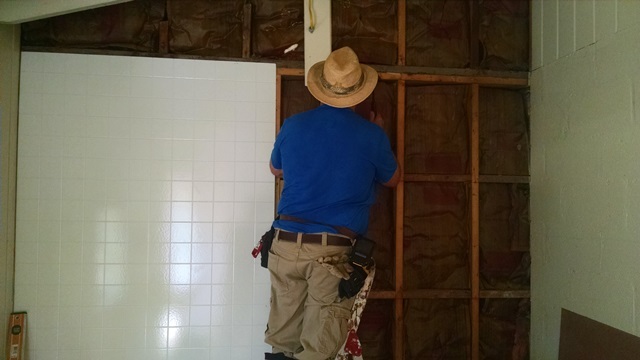 In the past we all would call a professional to repair our plumbing or sheetrock. Now with the DIY (Do It Yourself) movement we all watch a video and tackle a lot of projects ourselves. 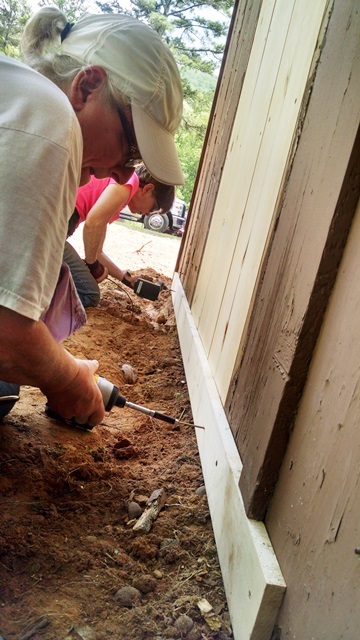 The Bible is filled with DIYers. Ordinary men and women doing extraordinary things. Examples: Moses, Paul, Gideon, the disciples. God qualifies the called rather than calling the qualified. Carol encouraged everyone to not wait until we feel qualified to answer Gods call, but rather offer our life for God to use as he sees fit. After devotion we reviewed where we were on all our projects then headed out to work. 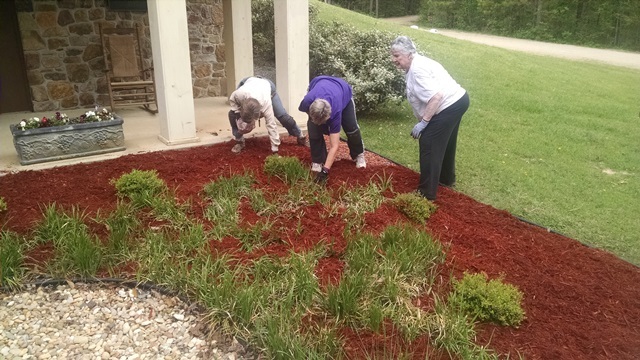 Anne, Marti and Harriet returned to weeding and mulching at the Lodge and Eva Walker. Anne had to leave about 10:00 to take Juno (Max’s Mom) to the doctor. 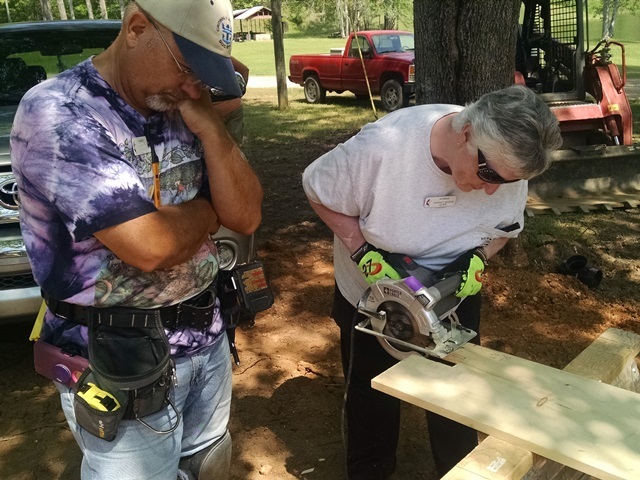 When Marti and Harriet completed the work at the Lodge, they went to Pool Camp to work on a large flower bed there. The landscaping at the camp is really looking better. 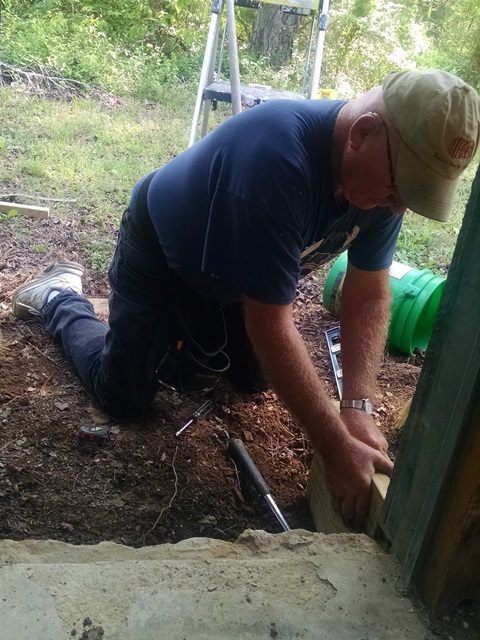 Patrick and Richard worked on partitions in the women’s restroom at the Lakeside Loo while Carol, Bill and sometimes Max worked on framing up the outside shower pads. Dave and Jim continued at Little Brown. 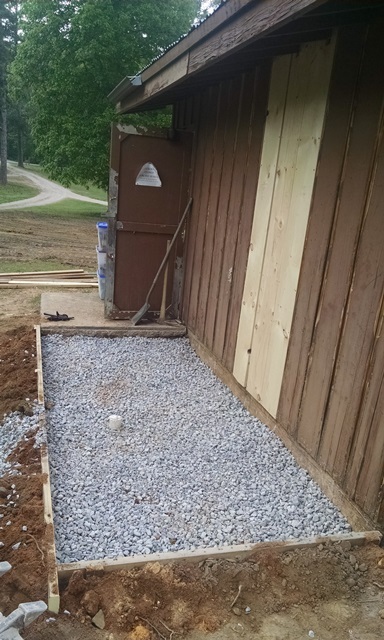 They completed the telephone enclosure and then formed up the concrete pad for the back door area. It was a busy day. 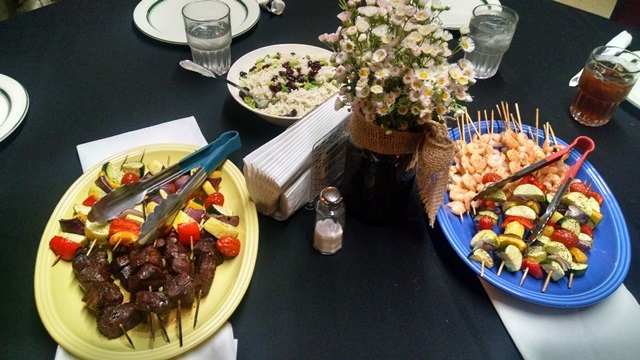 Tonight, the camp staff gave our team a wonderful evening. 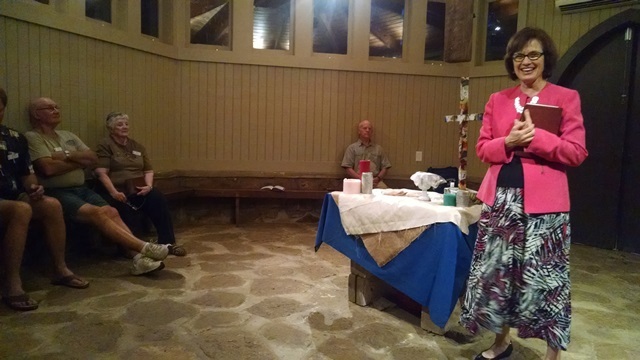 It was our “going away” get together, just a day early so that Bishop Padgett (Lee’s wife) could also attend. We were served a wonderful meal with lemon ice box pie for dessert. 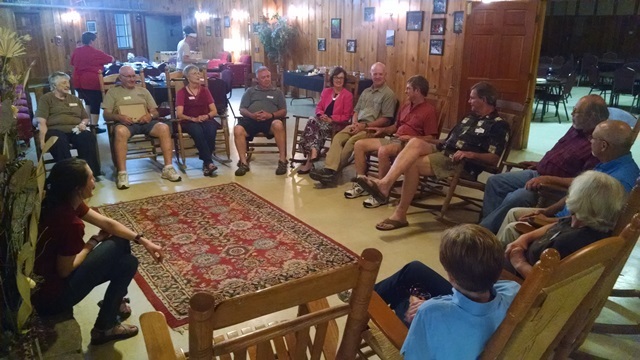 We then gathered in the rocking chairs around the fireplace for a time of sharing. We have been so blessed to serve as team leaders for this great group of NOMADS. 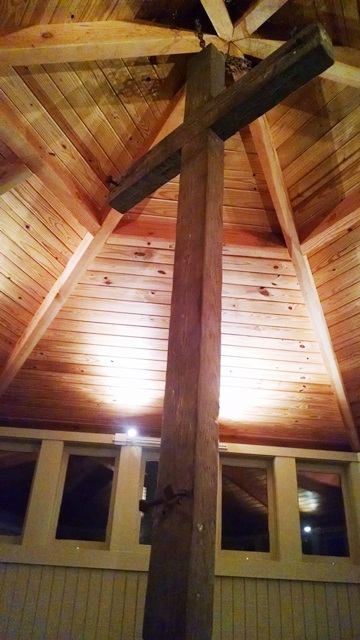 After our sharing time we went to the Nina Reeves Chapel for a communion service with our sweet Bishop Debbie. We so appreciate her taking the time from her incredibly busy schedule to join us and serve us communion tonight. It was a wonderful service and message on having a servants heart. Today was a busy day and we are all tired, but God blessed us once again. We get to spend one more day here and it’s sure to be another good one. Another partly cloudy day. It really was mostly sunny and we had no rain. Looked like rain several times but it all went around us. We know that the area needs rain but we are glad the rain is missing us right now because we have so much outside work to do. 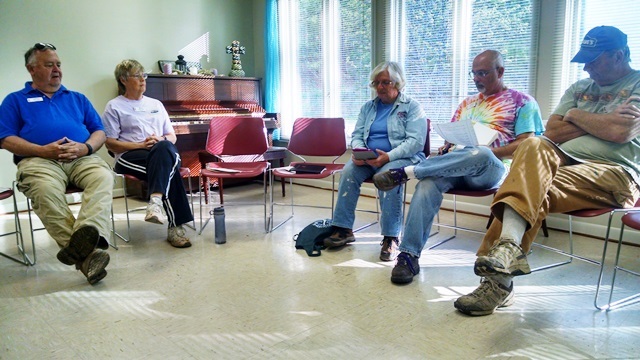 Harriet and Jim brought us our morning devotion today using Romans 12:3-13. She told us of all the different hats she has worn during the different phases of her life and had us thinking about all of our different hats. She challenged us to always do our best no matter what “hat” we are currently wearing. We only have the ability given to us by God and we should remember it comes from God and use it to our best. 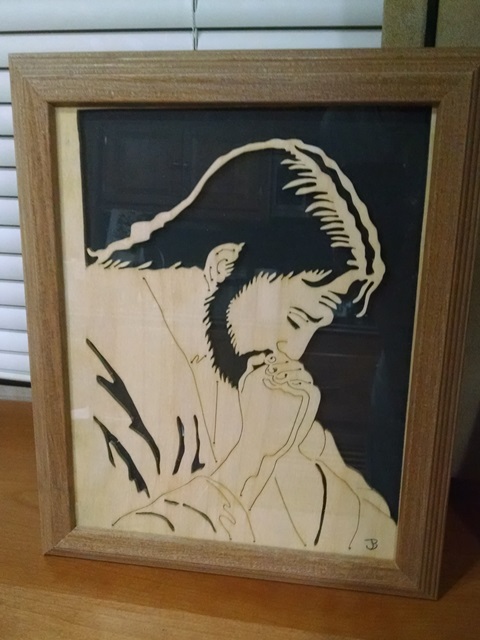 God has given Jim the ability to do beautiful work with a scroll saw and he has given each member a beautiful picture of Jesus he has done. 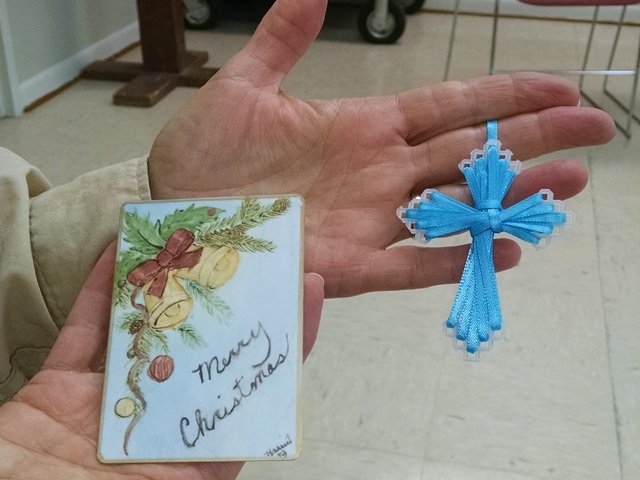 He also gave us some small crosses. God has given Harriet the ability to do china painting and she gave each of us a piece of her work. How wonderfully generous they are with their talents. Jim also shared a little funny he likes. “God promised the men there would be women around every corner. Then he made the earth round.” Jim brings us a funny most days. Yep, NOMADS laugh a lot. After devotion, it was back to work. 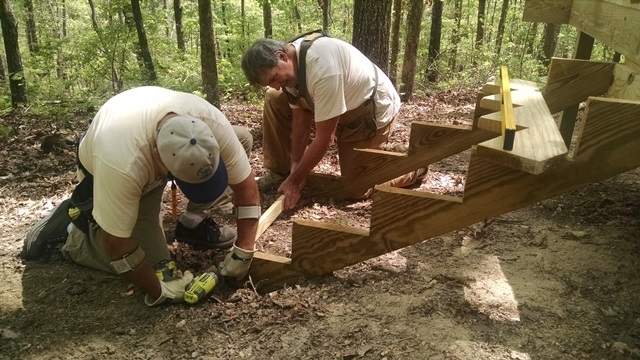 Richard and Patrick went back up the mountain to base camp to finish up the steps and clean up the area. 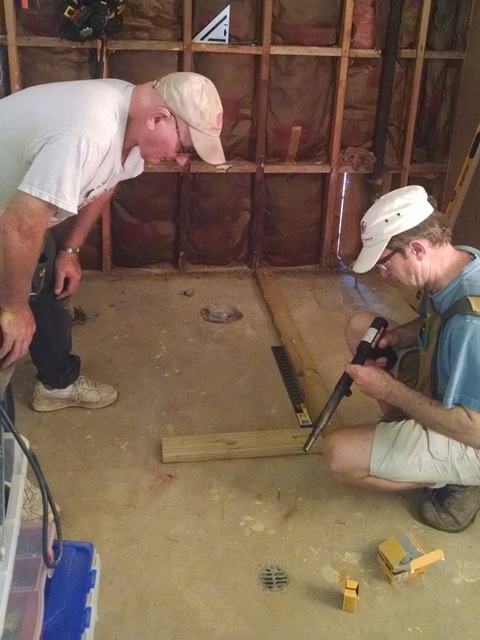 Dave and Jim went to Little Brown to enclose an area with phone and electrical. 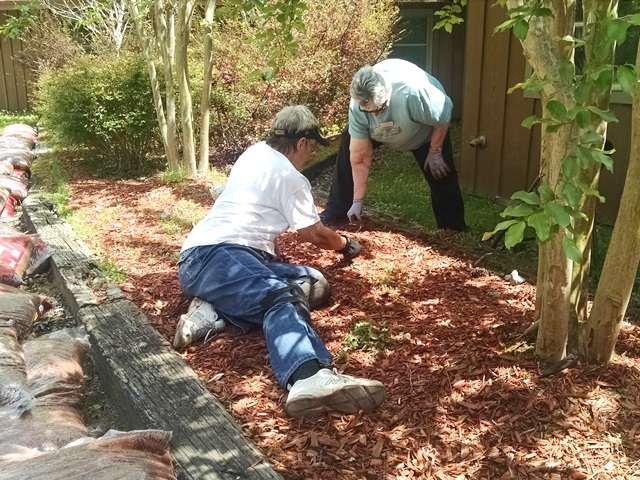 Marti and Harriet returned to McKinney to complete the little mulching that needed to be done there and then moved on to the Lodge to weed and mulch there. 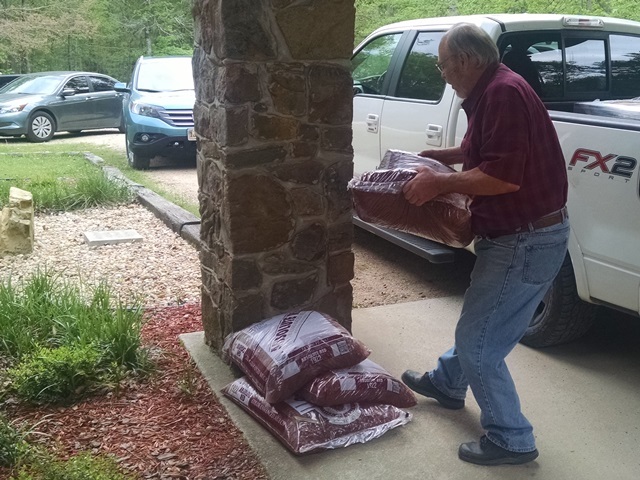 Dennis had purchased 75 more bags of mulch. That’s in addition to the 46 he delivered yesterday. Yep, Camp Sumatanga is a big place. Bill, Carol, and Anne returned to the Lakeside Loo with Bill continuing to construct and the girls continuing to destruct. 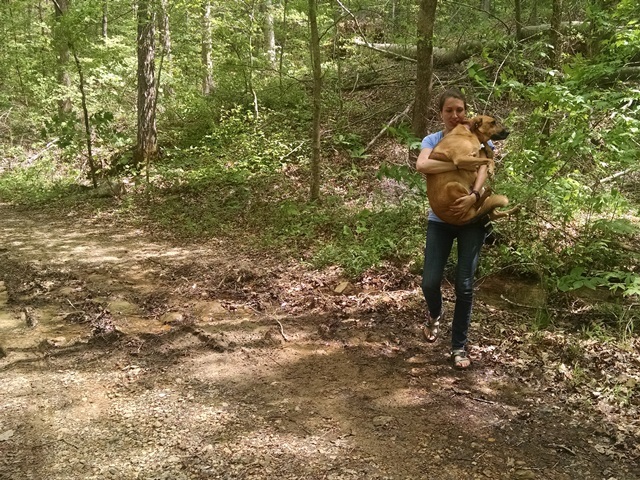 Max was all over the place trying to keep us all going. Anne was also between the Loo and the Lodge to be sure Marti and Harriet was getting along ok. 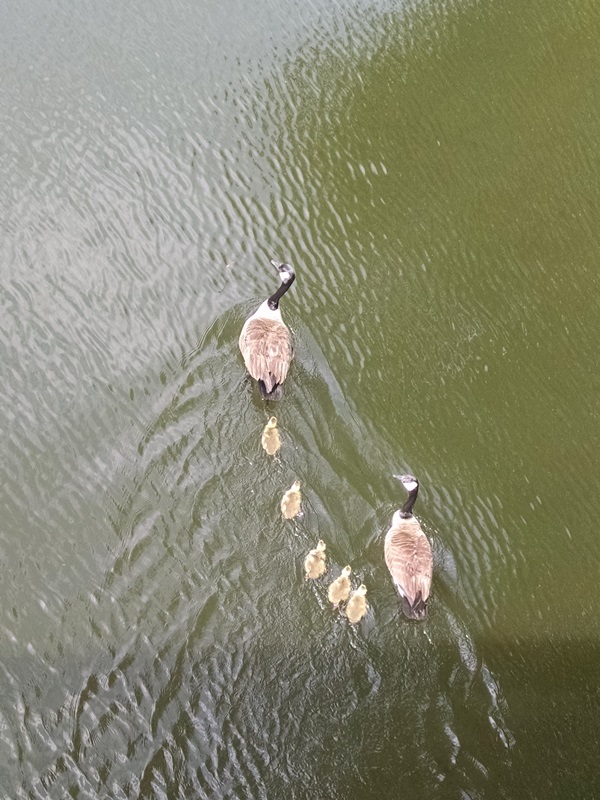 While we were at the Loo we were excited to see 5 baby goslings. We new they were probably around somewhere because two of the adults had become more aggressive the past couple of days. Richard even reported that one of the adults tried to attack him yesterday when he was out in his kayak and must have gotten a little to close to the nest. Today we got to see the family walking around the Loo and then into the lake. So fun!! 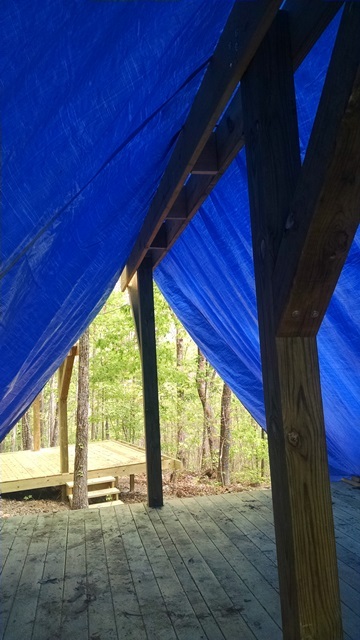 By the end of the day the tent platforms at base camp were completed. YEA!! That is unless something else gets added tomorrow. Tomorrow we plan to continue working on the Loo, Little Brown and hopefully complete the mulching. Only two more days to go – probably won’t complete it all, but we will give it our best! 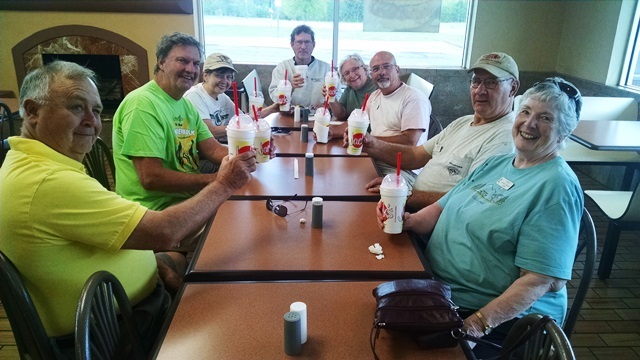 At the end of a long, hot and physically tiring day most of us went for Buy One Get One shakes at Jack’s. Anne had blueberry cream pie and Max had sea salt caramel. We couldn’t decide which we liked best. Both were very good. We all sat around in Jacks relaxing, and laughing for a while. A very good day. The morning started with partly cloudy skies but that also means mostly sunny. We knew we would have to watch the weather a little more closely today because we were predicted to have scattered showers and thunderstorms, mostly in the afternoon. As we watched the weather radar during the day we saw showers and storms all around us but it never rained here. God is good! Dave did our devotion today and did a great job. 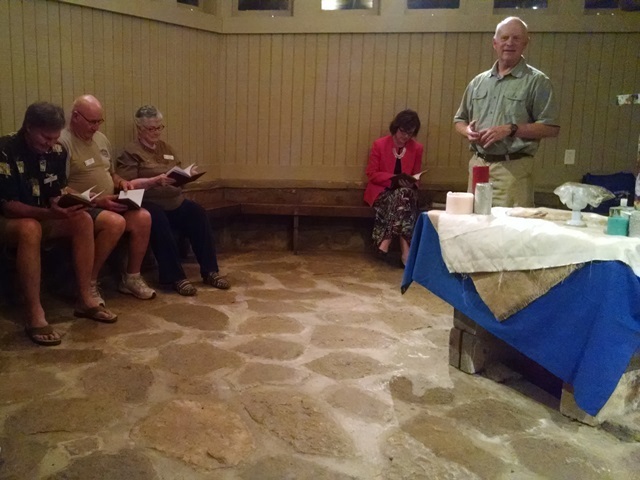 He started with the Beatitudes and the really funny questions from the disciples (link). Then he asked us if we remembered where we were – When President Kennedy was shot, on 9/11, on November 29, 1989. That last one made us all pause. We didn’t remember that date. It was when the Berlin Wall came down. He then related a story on a small group of Christians in East Berlin who met to pray for peace and their contribution to the fall of the wall. (For more information click here.) This team has really brought us some wonderful and thought provoking devotionals. We really appreciate their efforts. We feel that our morning devotional time is the foundation for all that goes on with our projects and the most important time of our day. After review and adding to our prayer list and our closing prayer we were ready to go to work. We reviewed the status of our various tasks and the pretty much started back where we left of Thursday afternoon. That meant that Harriet, Marti and Anne went back to McKinney to mulch the beds they weeded Thursday. 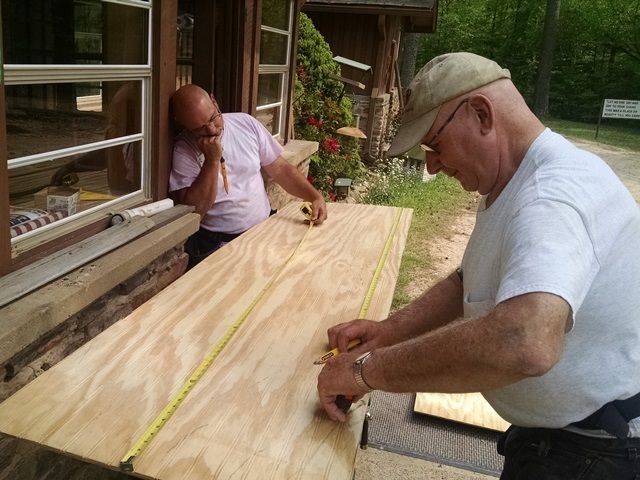 Bill and Carol went to work on the Lakeside Loo (bathroom). Max, Patrick, Richard, Jim and Dave went back up the mountain to work on the tent platforms. The mulchers ran out of mulch shortly before lunch and went to the Loo to assist Carol and Bill. Lots of progress was made today. The McKinney beds look much better and need just a little more mulch place. Walls went up and a window came out of the Loo, along with some trenching for new sewer lines. 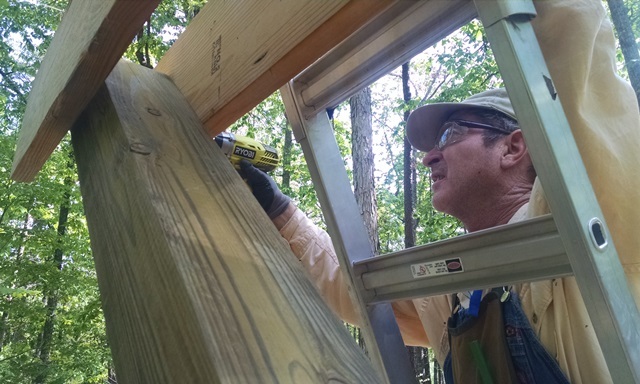 Two sets of steps were built and all the 6×6 angle braces for the ridge beams were installed. All that is left at base camp is 2 more sets of steps and clean up. We only have 3 more days and still a lot to do but we are getting close to completion on some of the tasks. We did not expect to complete it all. 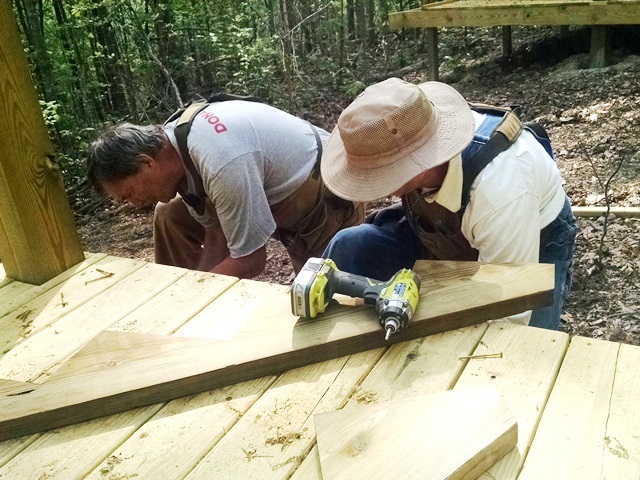 Others will come after us to do that, just as we are completing the tent platforms that someone else began.